CARSON - It seemed as if her comeback was practically a done deal. Maria Sharapova walked on the court like a champion and played like one Monday night at the Los Angeles Women’s Tennis Championship. She breezed through the first set in just 20 minutes, beating Slovakia’s Jumila Groth easily 6-0. “Her game plan was to attack but I was able to retrieve and make her hit more balls,” said Sharapova. However, the second set was a different story at the Home Depot Center. Whatever Groth’s coach said to her during the break set a new tone and suddenly there was a match. It looked like a #60 (Groth) in the world playing a #61 (Sharapova). Step it up she did. The former #1 proved why she won all those majors….prevailing to take the second set 6-4. About the only thing hinting Maria may be feeling her recent shoulder surgery were five double faults in the second set. The worst came in the third game when Sharapova missed both serves on the final point, in effect breaking herself. But on the positive side, Maria aced Groth three times. 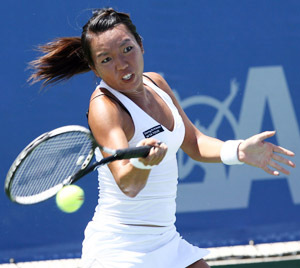 Other winners on the first day at the LA Women’s Tennis Championship include American Vania King beating Sybille Bammer of Austria, 6-3, 6-2. A big win for Jill Craybas of Huntington Beach. She defeated 16th ranked Francehesca Schiavone of Italy. American wild-card Coco Vandeweghe took out Italy’s Tathiana Garbin 6-4, 6-4. On the losing side, Arizona’s Meghann Shaunessy defeated by Alona Bondarenko of the Ukraine. American Carly Gullickson lost to Japan’s Ai Sugiayama 6-3, 6-1. CoCo Vandeweghe, U.S. def. Tathiana Garbin, Italy, 6-4, 6-4.